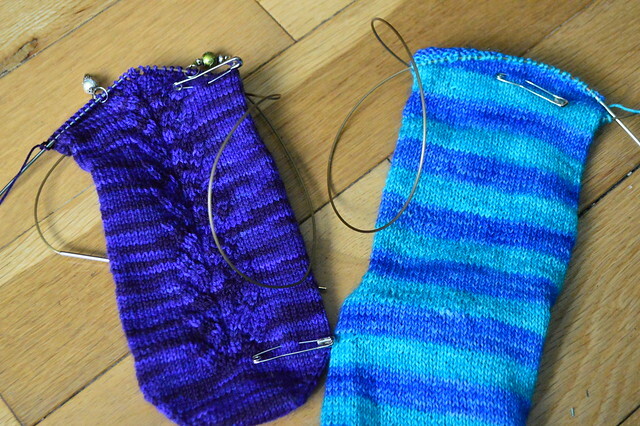 The purple sock on the left is almost ready for me to turn the heel. I used the safety pins to help me keep track of which row I'm on. The bottom pin is the starting row, the top one marks row 70. Saves me having to start right back at the begining each time I count. Although I guess I could just count the pattern repeats instead which would be simpler. Oh well! Hopefully I can get a swatch done today if I have time and then I can start taking measurments and working out stitch counts and cable patterns. I'll share more about my plans later as they're a bit vague at the moment! I love that purple sock! I've made that same mistake with ribbing. So frustrating! Oopsies on the ribbing. Sometimes one is on automatic pilot. The blue yarn has zing. It's a solid blue for spring and summer. Ooh your sock looks gorgeous. 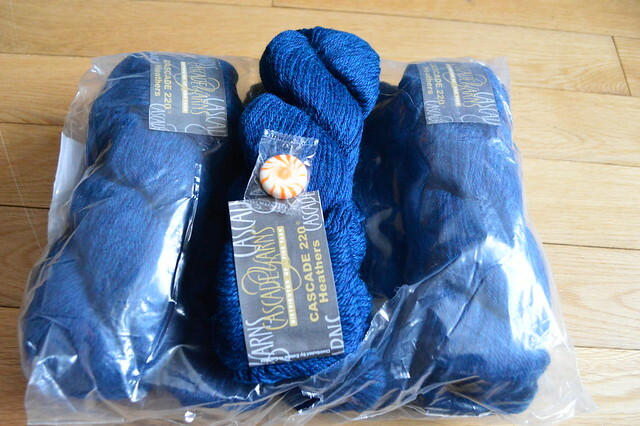 I seem to be leaning towards more blue yarns lately but they have to wait until I finish off some other items first like sewing buttons onto finished garments. boy oh boy does your husband get lots of knits, what a lucky guy! Bummer about the ribbing but I bet you've fixed it by now! !